Train in military casualty care with the all-new ITLS Military 2nd edition program that combines the fundamentals of ITLS trauma assessment and treatment with recent military innovations utilized in the world’s current war zones. The demands and limitations of providing effective trauma care in a combat situation necessitate special adaptations of trauma assessment and treatment used in the civilian medical system. ITLS Military adapts proven techniques taught in the civilian ITLS course to the military environment where limited resources are the rule, not the exception. 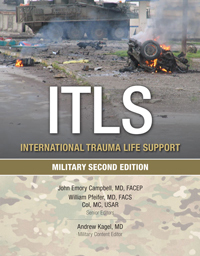 The ITLS Military 2nd edition text is a custom edition of the ITLS Provider manual, developed by military medical providers from medics to physicians, incorporat­ing their recent combat experiences. The military-based scenarios are customized for the challenges faced by military personnel. The text can be used as the course manual for an ITLS Military Provider course or as a stand-alone resource.